VatorNews | What's Your PR strategy? If my question makes you think, "What PR strategy?" then this article is for you! When I ask that question of the start-up founders I work with, I usually get blank stares. Or, someone will say, casually, "We'll send out a press release when we launch." Let's stop right there, guys. "PR" does not stand for "press release." It means "public relations," which is an essential aspect of marketing and brand awareness. The press release is not what it was back in the days when we had fewer media outlets and the standard procedure was to send out a two- or three-page release and hope someone would pick it up. Today, social media, email, websites and more give us not just a multitude of new sources but also more ways to speak directly to the public, prospects, investors and others besides the media. A press release is a small drop in the bucket of public relations. Now its goal is to serve SEO – search engine optimization, also called "natural" or organic search. 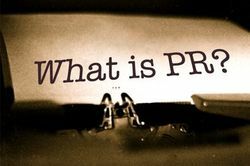 What goes into a PR strategy? You need not abandon the news release, but a public relations strategy means so many more things now. Write this down, and post it where you'll see it: A good PR strategy addresses how to get your message out to the community in the best possible light without appearing self-serving. A good PR strategy lets you control the narrative and information. A bad one takes the control out of your hands and causes people to think badly about you or your company. I recently read a lengthy article in a magazine for accelerators in which the author talked about mistakes they had made, their failures and their hopes for the future. From a PR standpoint, I don’t know that I would have led off with the negative story. The narrative I want to control is the positive side. That's the key point in a PR strategy: control the positive; don't accentuate the negative. Your PR strategy should look at a broad audience and consider how different parties, with different experiences, expectations and interests, will interpret the information you put out there. Your PR strategy should focus on perceptions. The true story is learned when people pick the phone to talk to you or go to your website. That's where you can clarify your perception. 1. Content strategy: People like smart people, whether they're investors, customers, prospects, advisers or just interested in what your company is all about. A good PR strategy is founded on a good content strategy: putting out content that resonates with your target audience or vertical. A content strategy includes creating a content calendar with material that tells a story. Seek to educate your audience instead of selling to them. Blogs and thought leadership are sales-free zones. Understand who your audience is and what they need to learn. A coherent message that resonates with your users or prospects will shape positive perceptions of your company and products. 2. Communications: Email is the most common way to communicate one-to-one with prospects, leads, advisers and investors. Keeping those people informed regularly is essential for building good perceptions. Having regular email communications in which you talk about your content, company developments, products and industry evolution in your vertical is a vital part of an effective PR strategy. 3. Use a specialist: You don't have to keep a full-service PR agency on retainer (that takes major $$$$), but you should work with a professional rather than going it alone. A PR specialist knows how to put together a good strategy, has contacts in the media and knows what companies have done to achieve success and accentuate their products or services. If you're part of a business incubator or accelerator, your organization likely has contacts to help you with PR. You might even consider bringing on a PR pro as an adviser. No matter what you do, trusting a PR specialist will save you time and help you avoid egg on your face from a PR misfire. Thinking back to the accelerator magazine article, I wonder if the story would have been written differently had the owners consulted a PR pro. Many start-ups and companies go off in the wrong direction because they thought they knew best. Smart founders admit they have limits in what they know and will consult the pros to stay on track. 4. Budget: PR is a necessary cost of doing business. It's hard to track ROI, although ROI determines what your spend will be. You'll know when it's time to bring in a professional. Before that point, know how and when you'll reach out for advice. That advice will be cheaper than executing a PR strategy that harms your brand and your company. As you build your marketing plan, development road map and forecasting, also think about your PR strategy. Call on a PR pro to advise you and factor in a reasonable expense as part of the necessary cost of doing business.